Fourth time for sailors going down the inter-coastal waterway from Rock Hall, Md. on Bristol 41.1, named Blue Heaven. 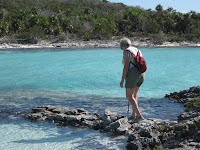 Planning to go to the Exumas,in the lower Bahamas again and up through the Abacos in the spring. We like being where it is warm in the winter! The next day we decided to move on. We motored down the bank side past Farmer’s Cay through Galliot cut. 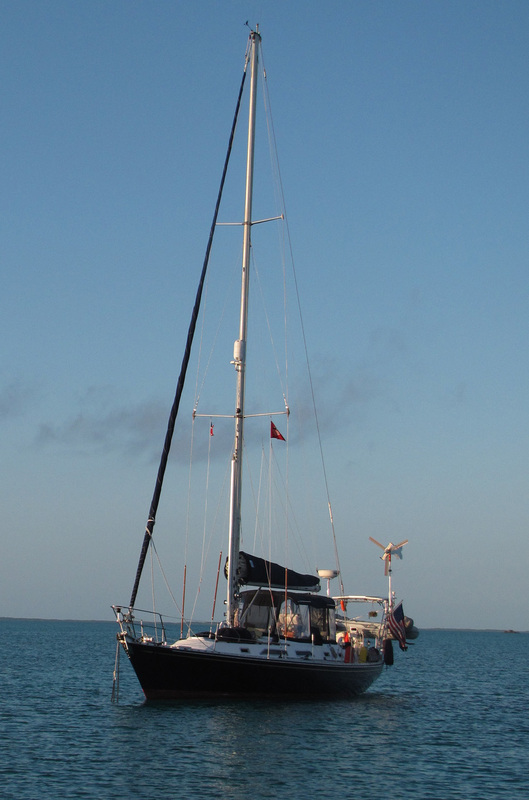 There wasn’t a lot of wind and it was near slack tide so it was an easy out. 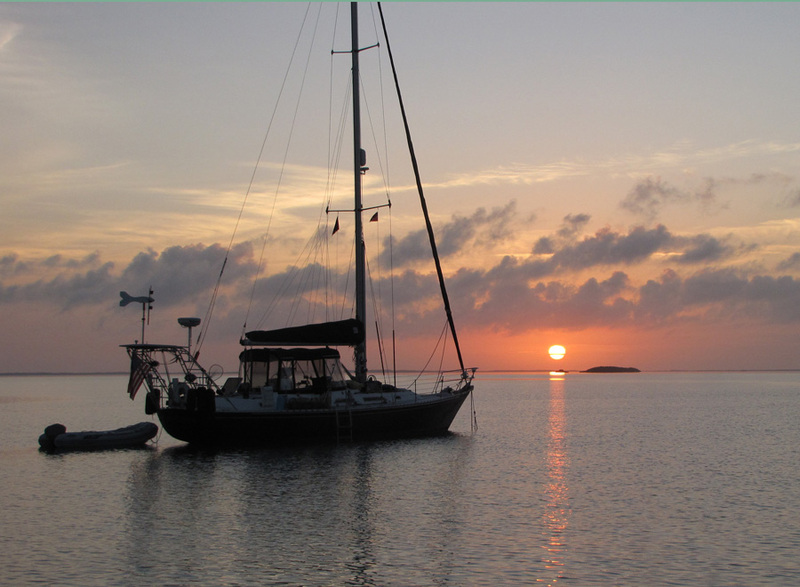 We actually got to put up both sails and sailed to Adderly Cut and anchored off of Leaf Cay with First Edition. He does have pretty coloring! Arleen feeding the many iguanas. 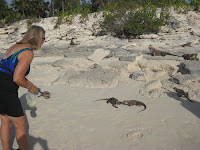 We went by dinghy to see the iguanas on the beach. There were at least 15 – 20 of them waiting for a hand out which was cabbage and crackers. The waters seem warmer this year so I took a swim off the boat. 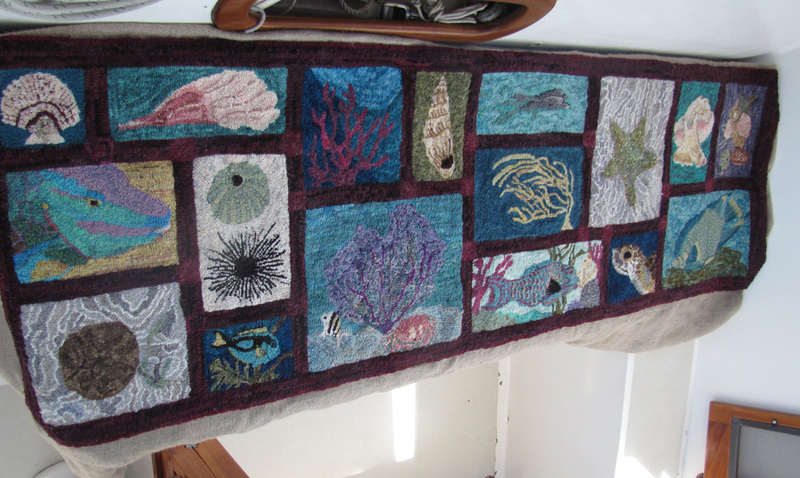 Bahamian Sea Life done except for the edge. After dinner I finished hooking my “Bahamian Sea Life” rug. Now all I have to do is find someone with a sewing machine so I can zigzag the edges and turn them under to finish with cording and yarn. Hopefully, someone on a boat in Georgetown will have a sewing machine. One of the steeper spots! We motored only 3 miles to our next anchorage. It is probably one of my top five places I liked from the last trip. 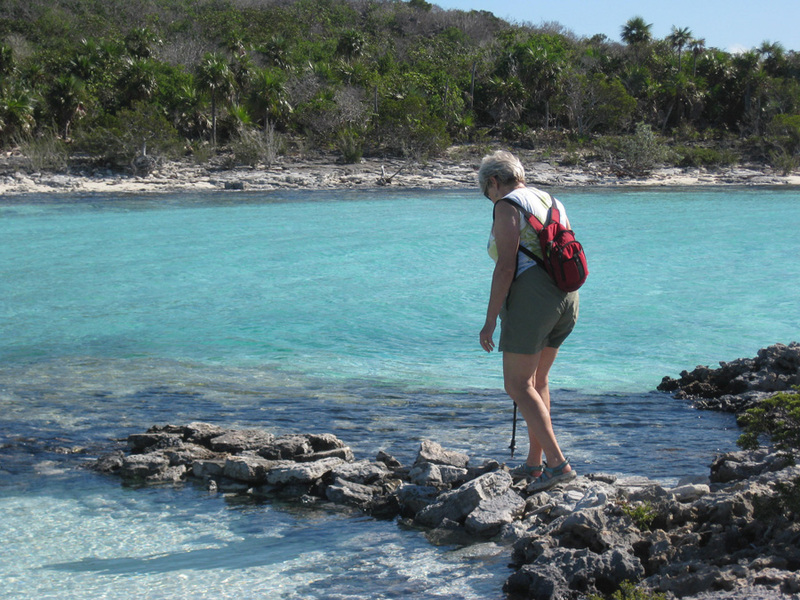 It is called “Twin Beaches.” Our first expedition was to hike to the highest point in the Exumas which gave us some great views. 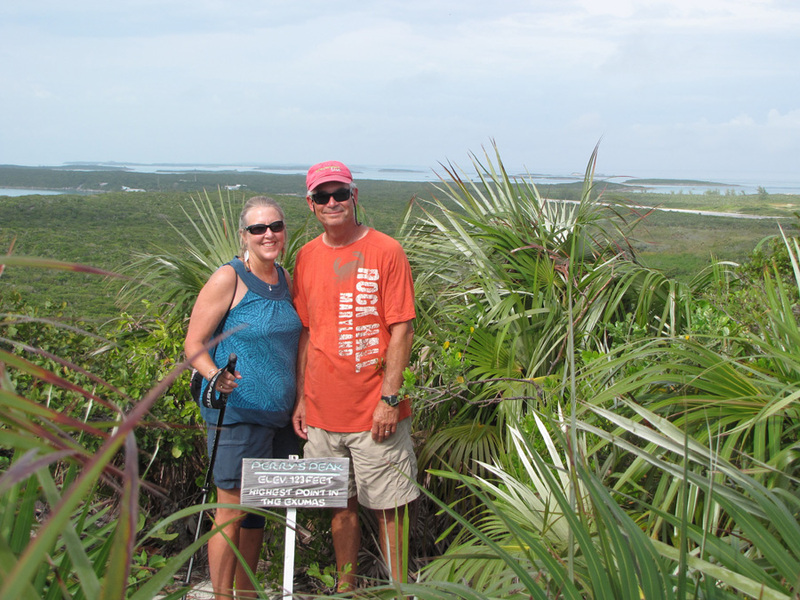 Perry's Peak the highest spot in the Exumas. 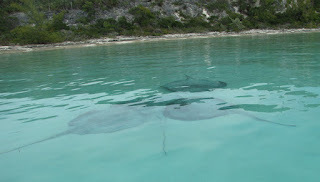 Then coming back there was no wind so it made for great underwater looking from the dinghy. 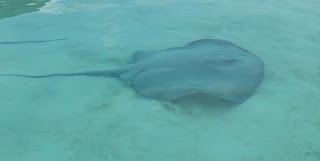 I got pictures of a hermit crab, starfish, barracuda and the rays from the dinghy. 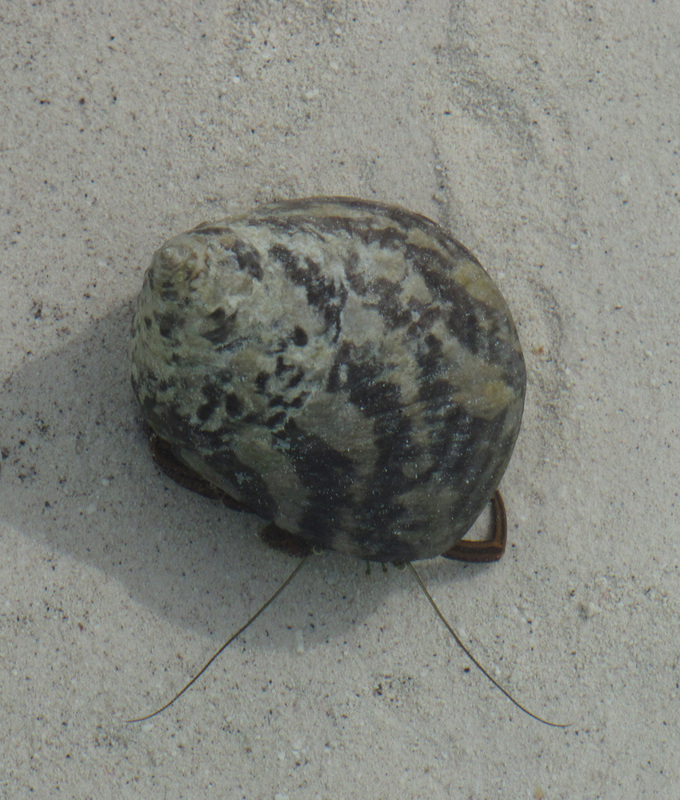 Hermit crab underwater along the shore line. 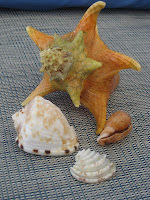 Star fish from dinghy in about 7 foot of water. A ray at about the same depth. Deep hole- wonder what lives there? We never saw rays gather together in one area like we saw. 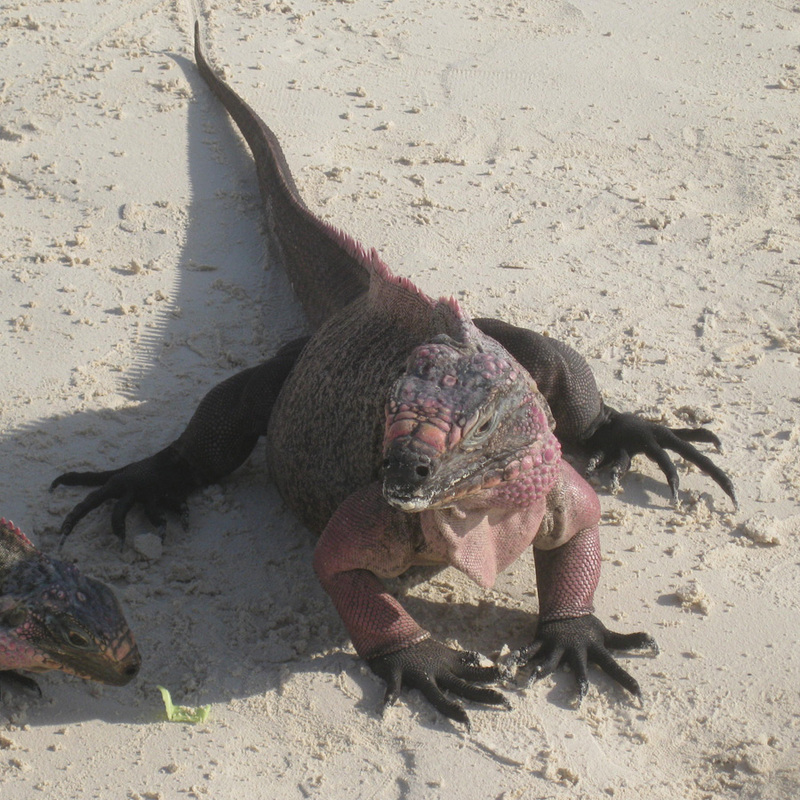 We don’t know if there was some sort of food there or some mating habit. 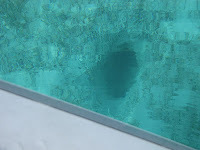 When we got back to the boat we noticed this deep dark hole next to our boat. We have no idea what lived in there, and we were not going to try to find out. Al getting into it also! After lunch we walked across to the sound side to find sea glass. Lynn and I love doing that but even Peter and Al got into it too. It was a great afternoon with a shared dinner on First Edition to end the day. 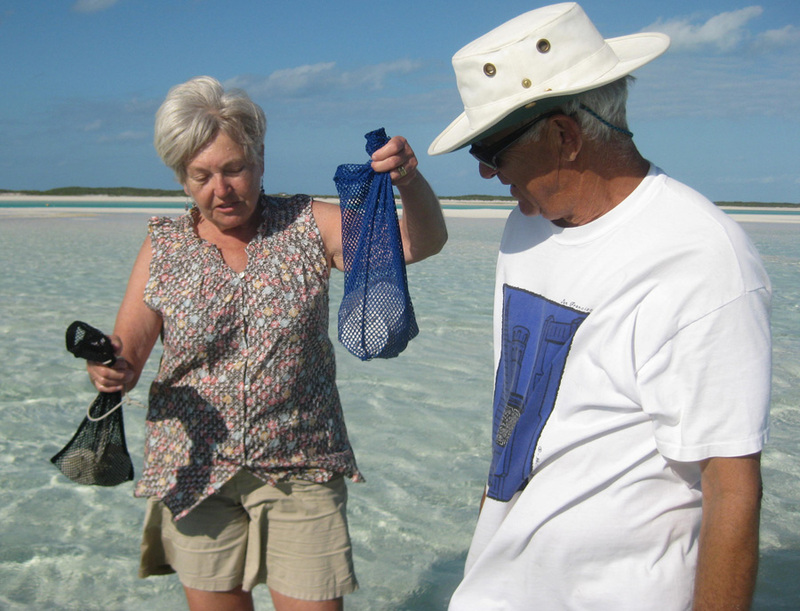 Peter and Lynn capturing the treasured sea glass! Our view of First Edition midday with no wind. You can see from the photos I took of First Edition how the day changes from morning, to afternoon with no wind, to evening sunset, all having their own special beauty. The first night in Pipe Creek we had happy hour and played Mexican Train Dominoes on First Edition. It was my night to be the big loser. 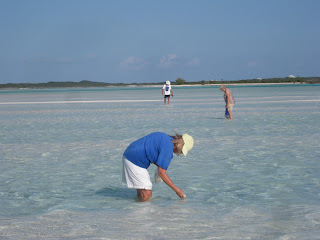 The next morning was bright and sunny to have Lynn and Peter show us where to hunt for sand dollars. As I was getting out of the dinghy on the sand flat my sandal caught the handle of the dinghy and I went down in the shallow water. I had my small camera in my left pocket so I twisted to keep it out of the water to which I was successful but not without twisting my knee. 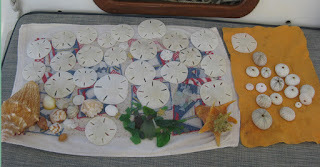 It hurt but it did not deter me from my sand dollar search. 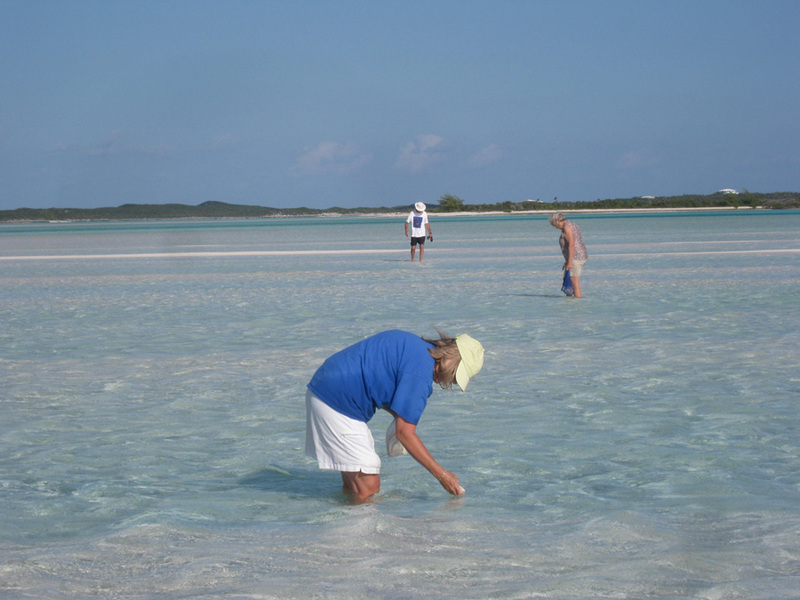 Looking for Sand dollars on the flats. 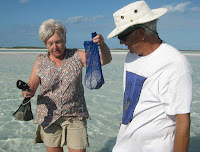 Lynn holding up her bag of sand dollars and telling Peter he did too much talking with Al! We then went over to Pipe Creek Yacht Club beach. You can see that the yacht club consists of what ever floats up on the beach, including a table with a vase with a green arrangement. It is quite fancy as you can see! 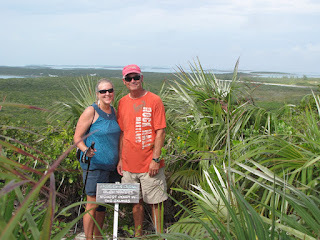 We walked the trail around to the sound side in search of sea glass and shells. We found both as well as sea urchins. You can see my stash for the day. Quite a haul! How many will get back home in one piece is the question? 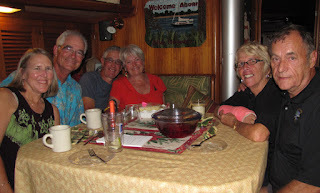 We shared dinner on board Blue Heaven with Lynn and Peter and then called it a night with both of us planning to leave to head to Black Point to do laundry and internet and ride out a front that is to come through tomorrow.We headed out into the sound and motor-sailed to Black Point. 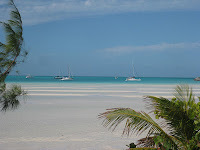 Here we went in to do laundry at the best laundromat in the Exumas and to get internet at Lorraine’s Café. While I did that, Al got rid of garbage and hauled water to the boat from a spigot which is next to the road. Both were done for a small contribution you put in a box on the trash trailer. We also got two loaves of bread from Lorraine’s mother, one being her famous coconut bread. 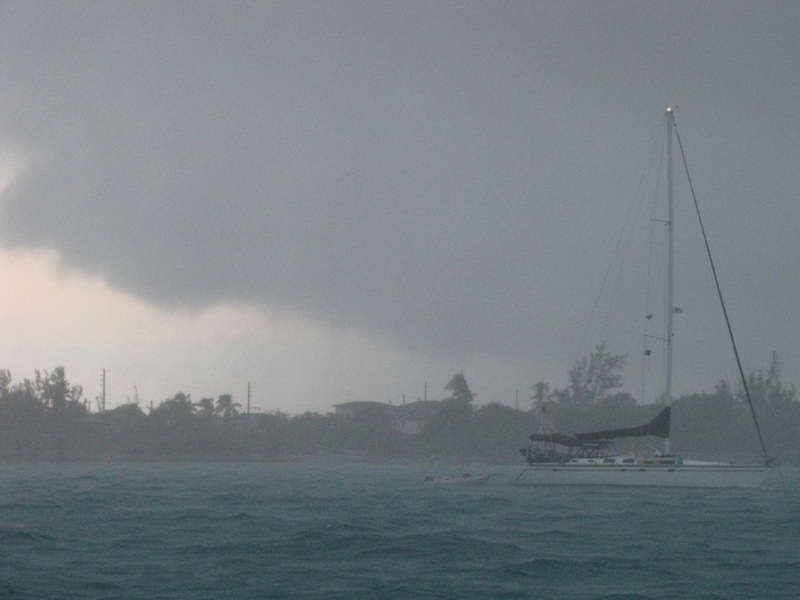 We were glad we got back to the boat when we did because we saw the front coming in, as you can see in the photo. When the rain and wind finally reached us, it wasn’t terrible but that night rollers were coming in making us rock and roll uncomfortably. 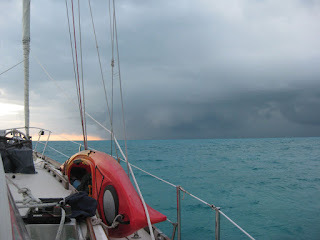 It was one of the worst nights I had spent on the boat. I finally moved to the main cabin which is closer to the center of the boat to get a few hours of sleep. Black Point- a beautiful spot. 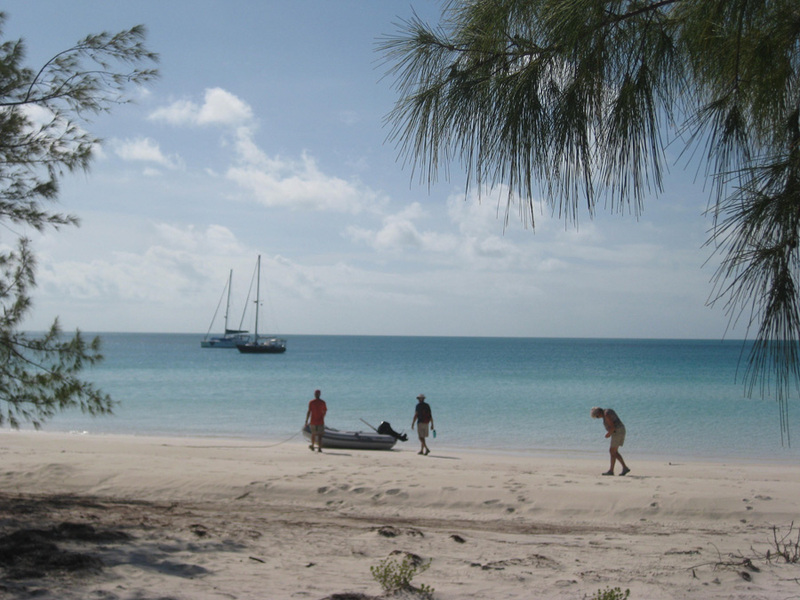 The next morning it quieted down just barely to go by dinghy to get off and walk to the sound side of the island to beach comb. When we got to the dock we met another “crazy” couple who fought the waves to land and they came from a powerboat named Utopia. We commiserated over the miserable night and said we were moving to Little Bay about two miles on the bank side of the island which we did and they followed. It was the best move, because we had a super peaceful night. The next day I baked cookies for Christmas and later we got off on the gorgeous white sand beach to walk over to the sound side to look again for shells, sea glass and sea urchins. There was a pink structure on shore which had been the start of resort that once again did not get completed, but someone lives on the first floor. We don’t know if they are caretakers or renters. There was another structure that looked like a castle. It was a private home built by a couple from California. Al and Peter met the husband on their walk and Lynn and I met the wife on the beach the next day. They call their home “Sand Castle” which was so appropriate. 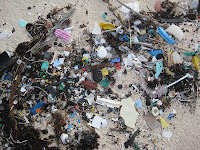 Unfortunate plastic and trash on beach. 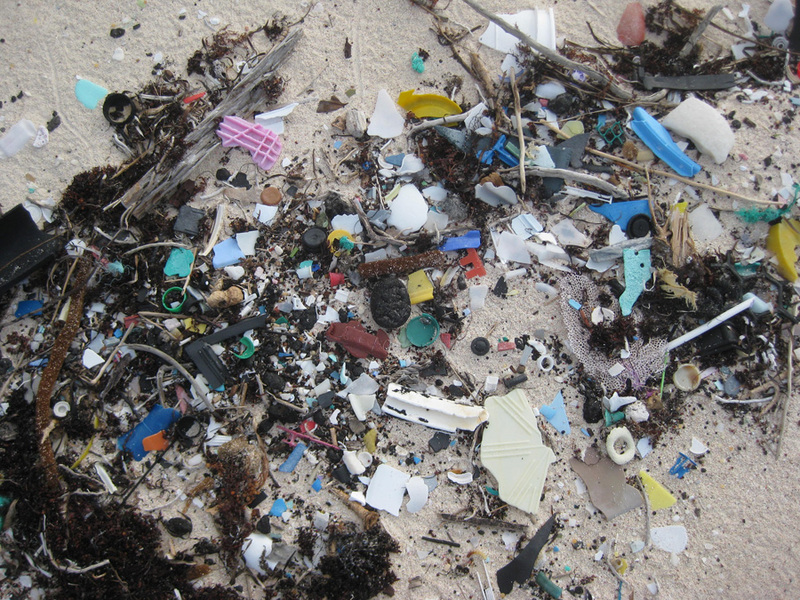 Although the beach was beautiful on the bank side, you can see the plastic and trash on the sound side beach. 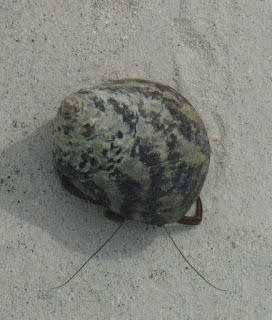 It is not a pretty site and this are how most of the beaches are on the sound. If more people saw this, perhaps they would reconsider using so much plastic which isn’t biodegradable! 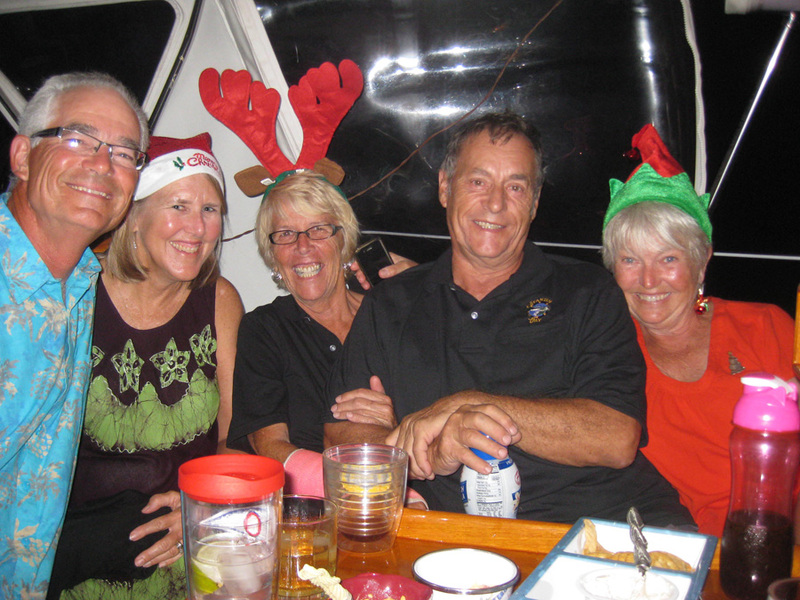 Us, Linda, Herb and Lynn having fun! Later we had happy hour on First Edition with Herb and Linda from Utopia. He was originally from Austria and has had a very interesting life and has been with Linda for two years, so they had many stories to tell. They invited us for Christmas Dinner which we gladly accepted to sample his Austrian cuisine. We beach combed early in the day Christmas Eve, but then came back to prepare dinner for First Edition and Utopia on Blue Heaven. Everyone contributed something and had a delicious smoked turkey breast, stuffing, green beans, jello salad and coconut cream pie for dessert while listening to Christmas carols. Afterwards everyone on their own boats, opened presents that Santa brought. Yes, he finds you wherever you are! Unfortunately you can not see the blinking Christmas wish on the hat. Our big Christmas morning was walking our trash to the dump with Lynn and Peter! It is amazing the things cruisers do to amuse themselves! We did not have the cooking to worry about, so why not. It was about 1 ½ miles so it gave us exercise we needed after our large meal last night. 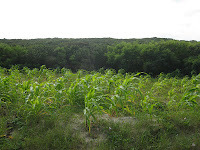 One unusual sight we saw was corn growing next to the road. 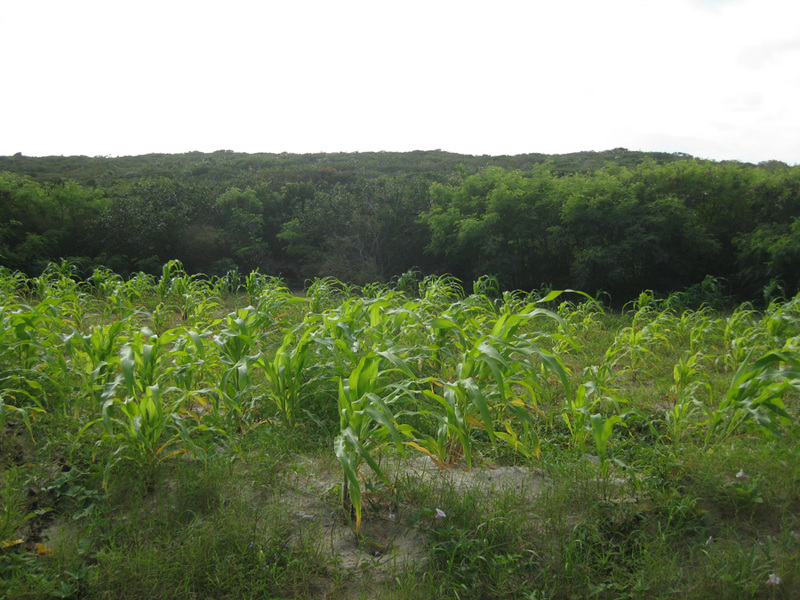 It was definitely planted by someone and we wondered how it fared in this dry climate and sandy soil. 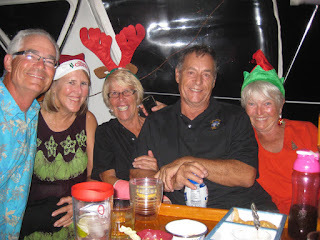 We also delivered some Christmas goodies to the two other boats in the anchorage while we sang “We Wish You A Merry Christmas” and had our Christmas hats on! 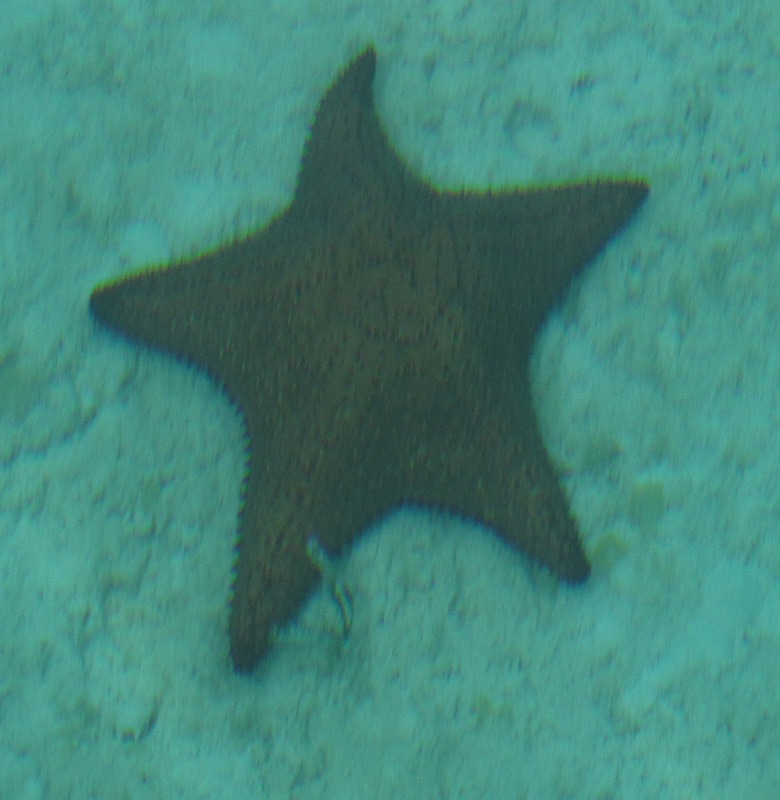 I also went to the beautiful beach seen from our boat to relax, read and walk the shallow waters where I spotted this starfish. Being near a cell tower, we were able to call my sister’s where our kids were having their Christmas celebration. It was great talking to them all. We went to Utopia at three o’clock to have our Christmas celebration. Being on a powerboat was a different experience being up high on the bridge looking down. 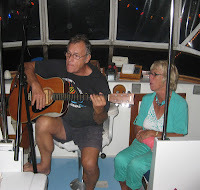 Herb and Linda sang and played the guitar to entertain us, playing some great original songs. I also tried out their hammock. I just could not pass it up! And my kids wonder what I do all day?!!! Herb prepared a wonderful meal of “Chickensnitzel” (like wienersnitzel (spelling?) 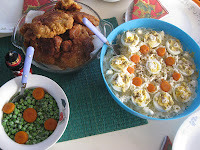 made with chicken instead of veal) German potato salad (the best! ), a pea salad, Lynn’s Caesar salad, a type of fried bread, and my cookies for dessert. We were stuffed to say the least! Herb and Linda entertaining us. After dinner we retreated to the bridge and had a conch blowing contest at sunset. I am not really sure who won but they had fun doing it. While we experienced another beautiful sunset, we sang while Herb played his guitar. 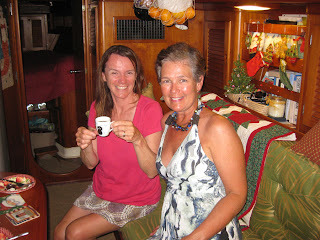 It was a very different but most fun Christmas shared with new friends! Where are all the crusiers? We got internet access before the big day(Christmas) so I thought I would do another blog because we have done a lot of things. 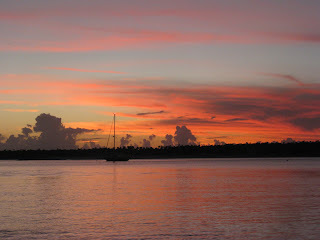 On the last blog we were still in Nassau getting ready to leave the next day. 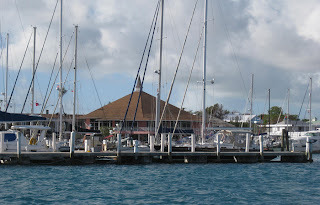 We had what Al called “Our Last Supper” which was our last good meal at a restaurant that wasn’t hamburgers, fried chicken, ribs, mac & cheese, and coleslaw, the typical restaurant food in the Exumas, unless you pay a fortune. We went with couples on First Edition, Night Hawk and Blue Bay to East Villa a wonderful Chinese restaurant. The next day we left Nassau Harbor Club to sail 6 ½ knots all day to Shroud Cay. What a sail! It was about time that we had a day like it! We got in and just chilled for the evening. 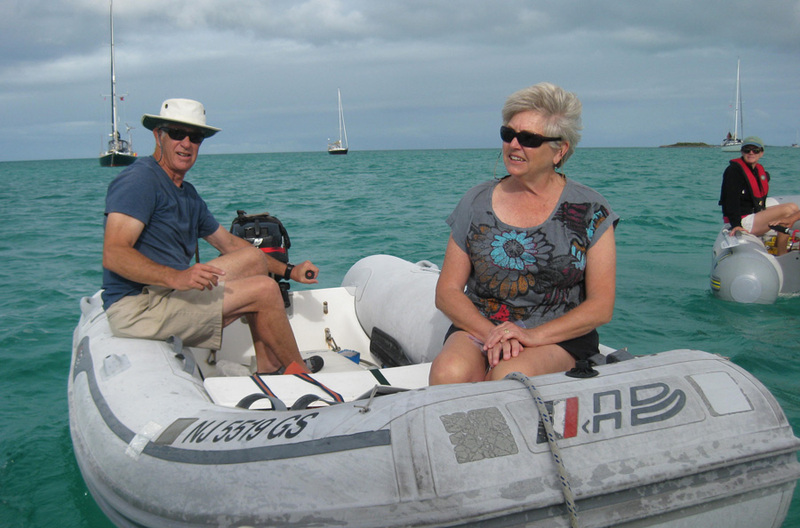 We came across with First Edition and another boat from the marina called Strathspey with Blair and Mary on board from Ottawa. 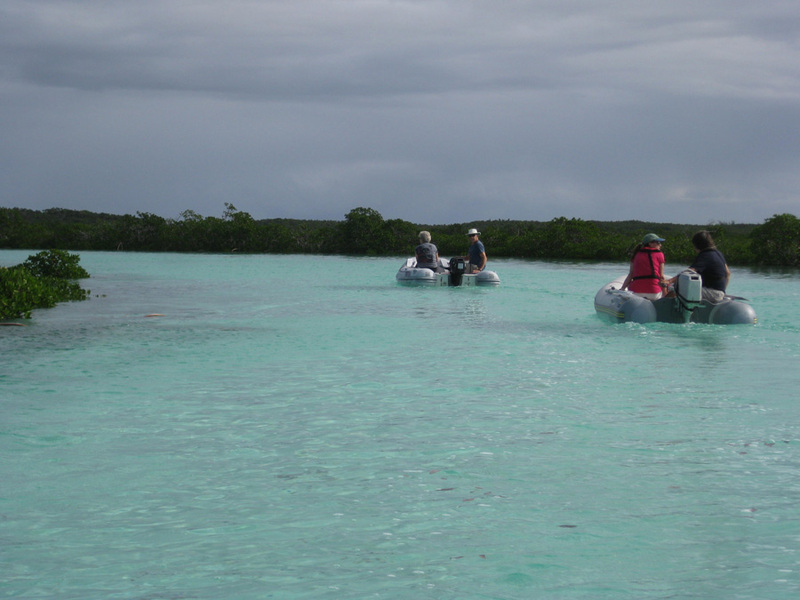 The next day we met at our boat at 9am and went in our dinghies exploring the mangroves and to a beautiful spot at a cut through to the sound. 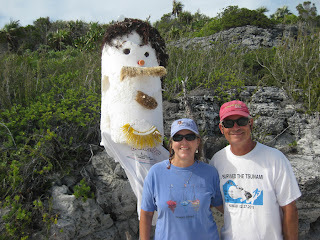 Here we got out on the beach and found a sculpture we called Mr. Hermit, made out of floatsum items. After lunch we moved on to Warderick Wells which is the Exuma Land and Sea Park. 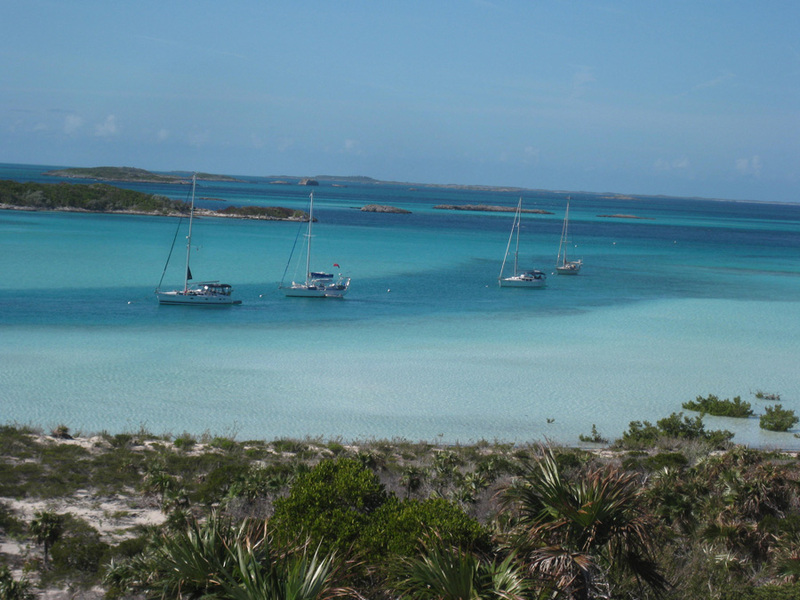 It is one of my most favorite spots in the Exumas. When we went to pick up a mooring, Al went for our boat hook and only then realized we must have lost it in those rough 4 -5 hrs. when we crossed over. Luckily we had two. Blair playing the bagpipes at sundown. 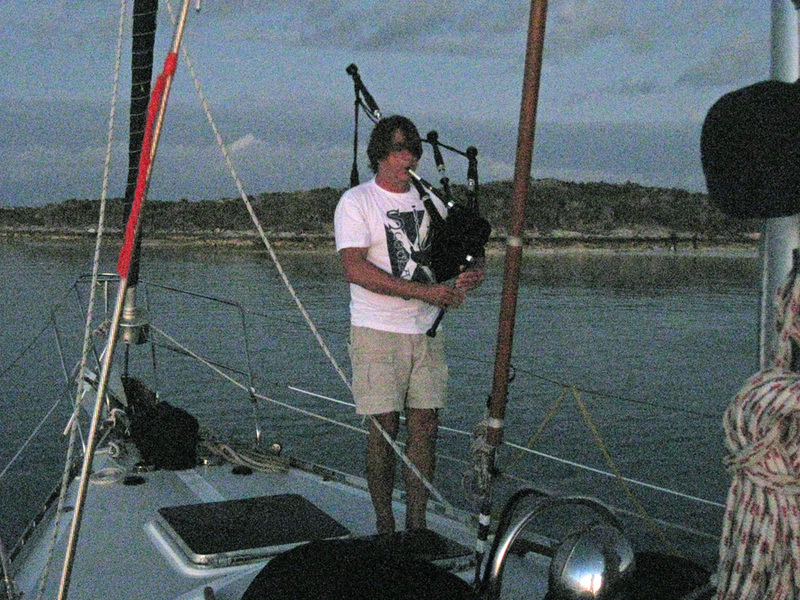 We had happy hour on First Edition with Blair playing the bagpipes at sunset. It was a neat experience again (if you remember we heard them in Fort Lauderdale too, but not on the boat we were on!). The next day we packed our lunch and went hiking with Lynn and Peter to get some great views of the park and our own boats. 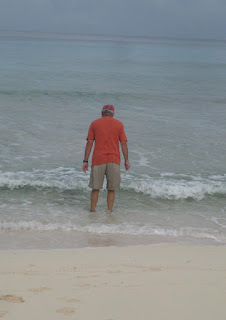 Can you tell the deeper water? Lynn crossing the water to get to the views. Boo Boo Hill with names of cruising boats on boards. 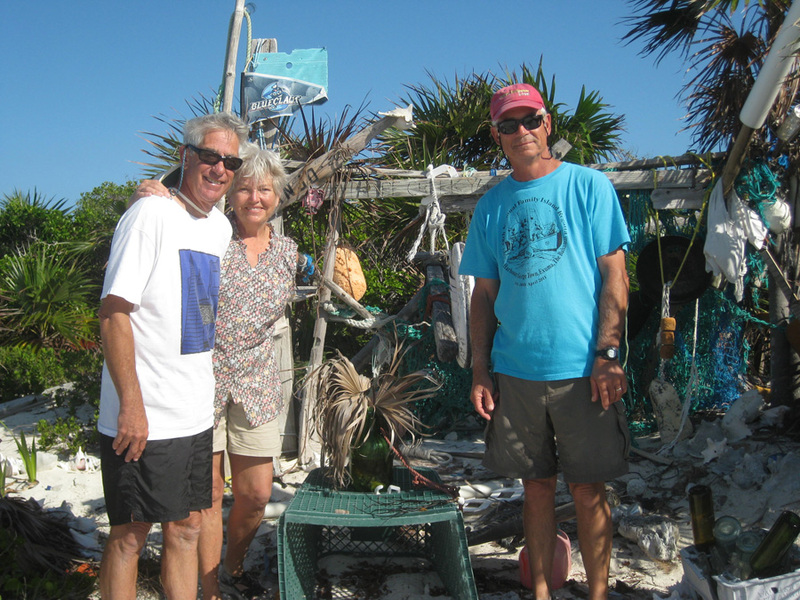 We stopped at Boo Boo Hill where cruisers leave their boat name on a natural object on the pile. It is quite large so many cruisers have passed through here. The view of the water is so magnificent. You can see exactly where the deep water is and the shallows are. 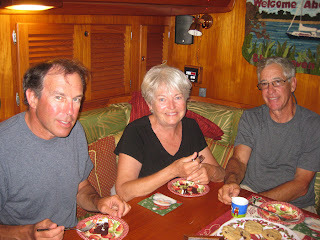 Later I baked a cake because Lynn and Peter, Mary and Blair and Susan and John on Summer Salt (a boat Al called on the radio and said according to my charts you are headed right for the sand flats, they had Navionics charts which we have found from other cruisers who have them, not to be reliable in the Bahamas. They were very thankful to say the least!) came over for dessert and a game of Catch Phrase. Blair making espresso to have with the cake. Mary and Susie, part of the winning team! We had a blast with girls against the guys, and of course the women won! 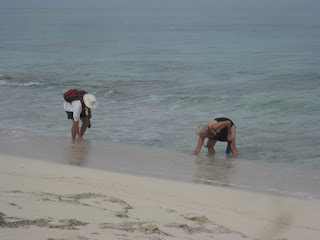 The following day, Lynn and Peter moved on, but we decided to stay another day to snorkel. 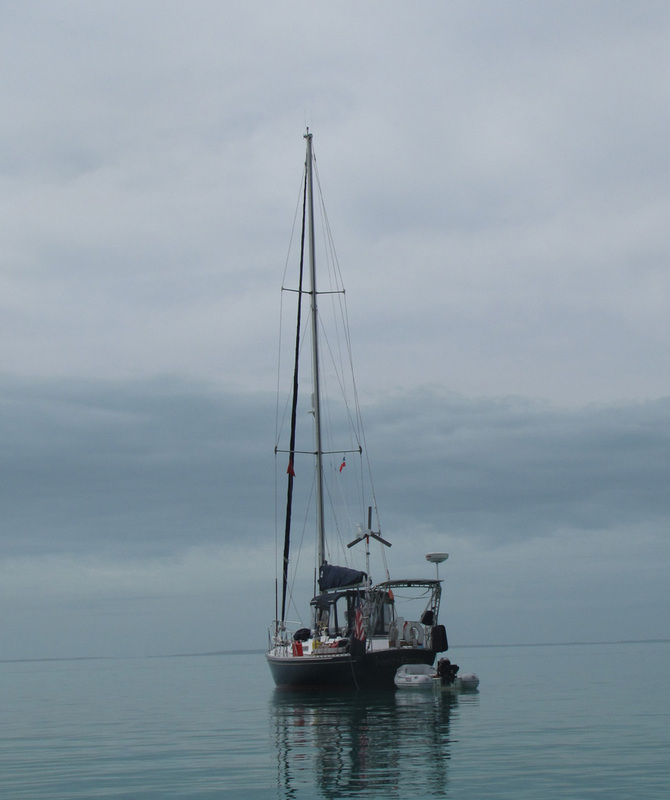 The winds were light so it made for good snorkeling. 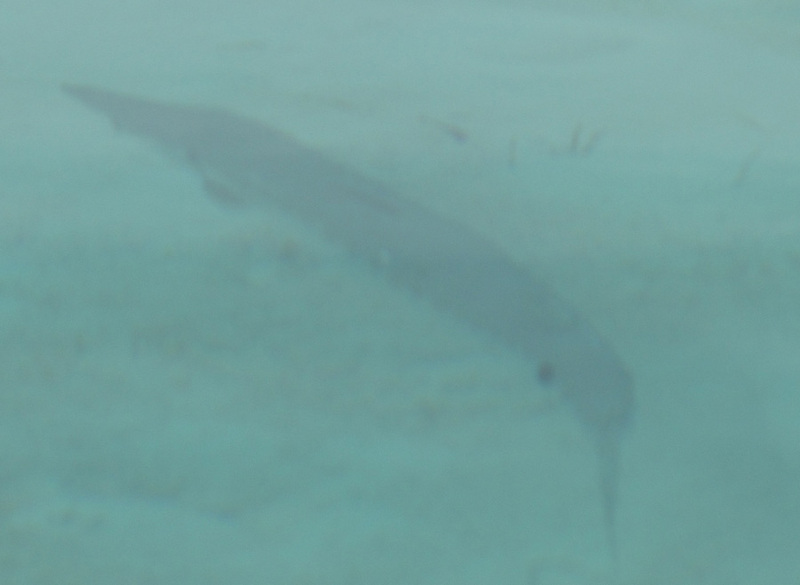 We went to two different reefs in the park and saw a variety of fish large and small and one of the dreaded lion fish that is a terrible predator. They actually would like you to kill the lion fish, but being in a “no take area for fish, conch or shells” we had nothing to kill it anyway. 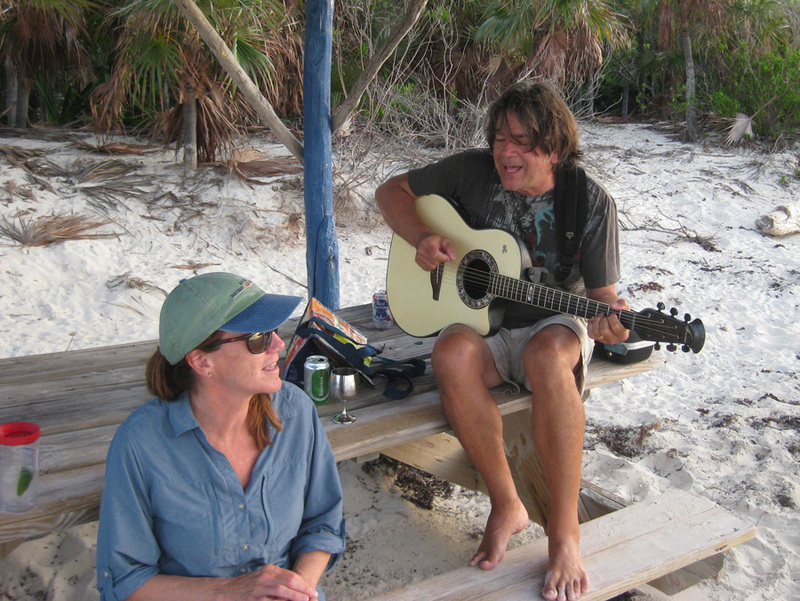 Later that day we went to the beach where Blair sang a variety of tunes with his guitar. 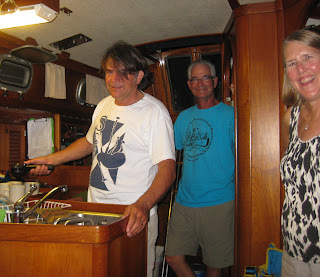 The next day we did a lazy man’s sail with just the genny, down to Thomas Cut and went into Pipe Creek where Lynn and Peter on First Edition were. 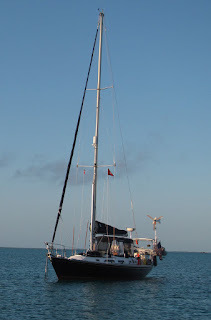 We were shocked to see only three other boats there, because on our last trip there were at least twelve boats there. Even in Warderick Wells the mooring were not full which have been in the past. 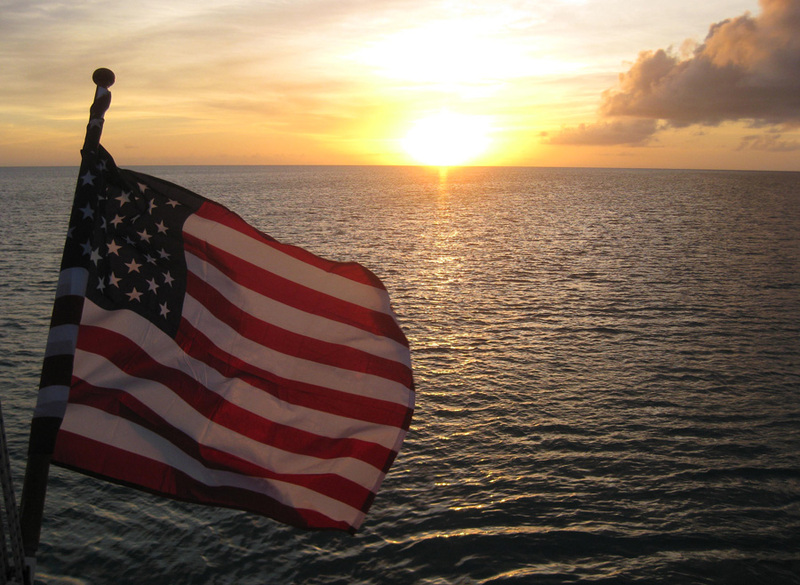 It has been light for cruisers this year. We don’t know if they are just behind in getting here due to hurricane Sandy or that there just aren’t as many cruisers this year. The real test will be how many are in Georgetown. Our Christmas Wish Came True! Sailing the Chesapeake Bay for 37 years. 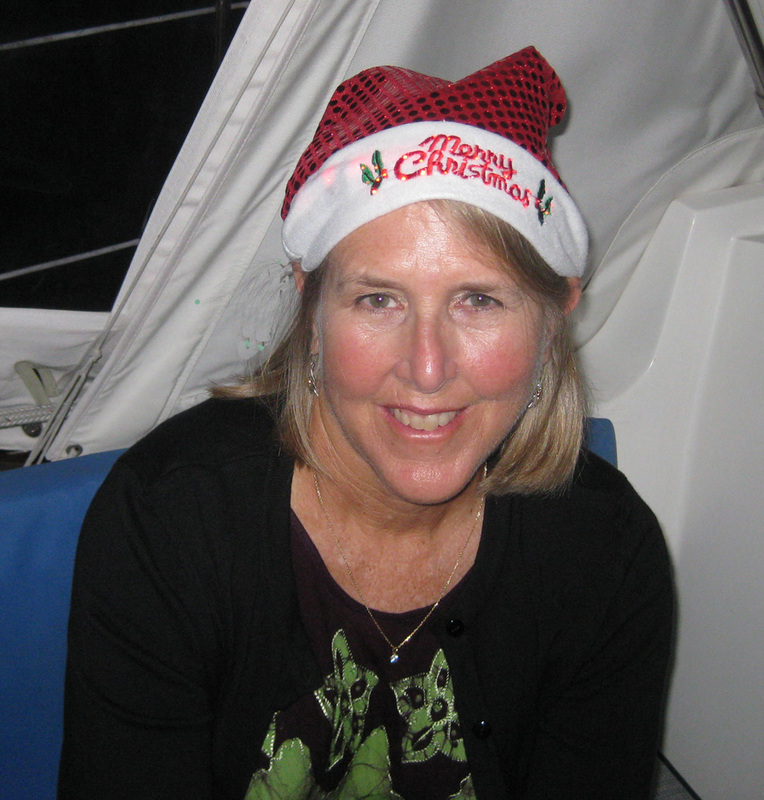 Have chartered in Greece 3x, San Juan Islands, and BVIs. 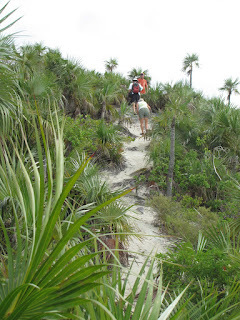 We headed south in 2008, went as far as Fort Myer's Beach on the west coast of Florida. 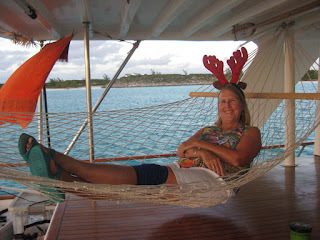 In 2010, we headed down the ICW again, and crossed over to the Bahamas in December and headed to the Exumas. 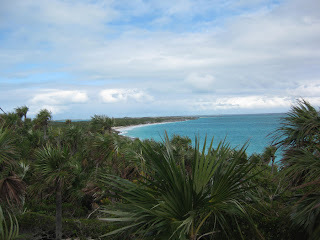 In the spring we came back through the Abacos. In 2012, we did basically the same as 2010 trying to visit some islands we have not seen. We did get down to the Jumentos. 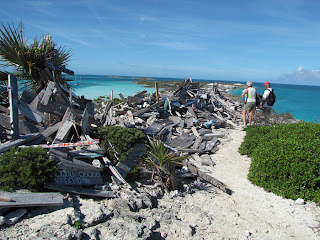 Same as 2012, we are going back to Exumas in 2013-2014 and see some more places we haven't been. Yes, there still are some! Now in 2015-16 we are repeating the trek to the Exumas hoping possibly to get a bit further to the Acklins. We just love the warmth and the beautiful turquoise waters as well as the people we meet!